Self-published authors are often self-starters and go-getters. Self-published authors often have their books professionally edited prior to publication. Self-published authors can be savvy business people who understand the publishing industry. Self-published authors often embrace self-promotion and social media outreach. Self-published authors may have already established a following before seeking a traditional book deal. Sales numbers, if possible. Sharing positive sales information can only help your cause. Literary agents don’t agree on what “good” self-publishing sales figures are. Some have said that selling five thousand books in one year is a good indicator of success, but others would never try to predict future popularity by looking at previous numbers (especially when there are unknown variables involved). Instead of citing exact sales figures, you could also mention whether your book turned a profit for you. Short quotes from reputable reviewers. Quoting reputable book blogger reviews or even reviews that you have paid for can be a great way to stir up a literary agent’s interest. You might also be able to get a book endorsement from a famous author for your self-published book. There’s rarely space in a query letter to quote entire reviews, so just include the best parts. Reviews by the numbers. Writers who don’t have reviews from well-known opinion-makers might still impress agents by mentioning the sheer volume of reviews the book received online. For example: Many writers will boast about having “500 five-star reviews on Goodreads.” Similarly, you might also include how many fans and followers you have on social media. A link to your author website. Rather than mentioning your author website beneath your name as part of your contact information, consider giving literary agents a concrete reason to punch your URL into their browsers. Tempt query letter readers to visit your website by promising more examples of reviews, more author bio information, or more information about your upcoming projects. Your reasons for self-publishing. Sometimes literary agents worry that a writer who self-publishes is a writer who prefers to have lots of control over the publishing process. If your reason for self-publishing is unusual (such as wanting to self-publish a memoir quickly before the death of a loved one), you might want to mention your inspiration. An explanation for lack of marketing. It’s no surprise that book sales might be low for a writer who hasn’t told anyone that his or her book is available. So if you have garnered little interest in your book because you’ve put little effort into promoting it, that might be worth mentioning. Just be sure to talk about your reasons for not promoting so that your reader doesn’t assume you are simply not interested in marketing your self-published book. A positive attitude. Even if self-publishing turned out to be a disappointment, focus on your book’s strengths and on your optimism about your next publishing adventure. Remember: No experience is wasted if you learn from it. Because self-published books have a “history,” there is a danger that a writer might be inclined to pack too much information into a single query letter. Remember: A query letter is a short introduction, not a full-length conversation. Stick to the essentials in your query letter. You can talk about details during future conversations. Here’s how to keep your query letter short. 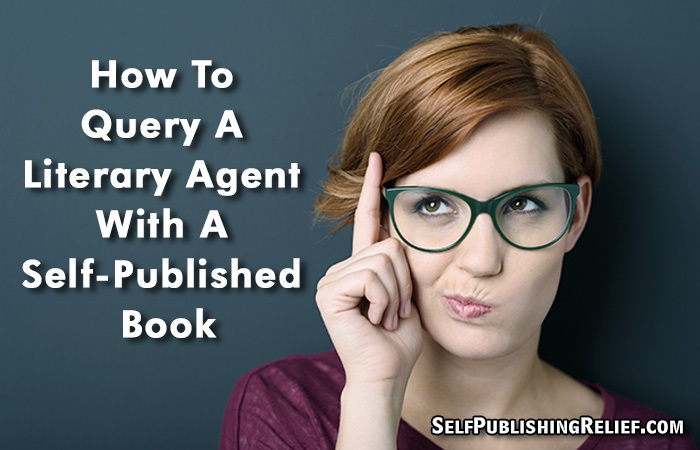 Question: Would you ever consider getting a literary agent for your self-published book?